What is the Bristol Blue Plaques Scheme? “Blue Plaques” commemorate individuals who lived or worked at a specific location with a blue-coloured wall plaque giving some basic information about them and stating their connection with the site. They can also honour organisations which have made a collective, rather than an individual, contribution. The Scheme recognises past residents who lived for at least some time within Bristol’s boundaries, and who have made important contributions to Bristol and/or the wider world. The plaques increase awareness among both Bristolians and visitors about these people. Plaques can celebrate figures who are well-known, but can also draw public attention to people whose contributions may have been overlooked, as well as to aspects of our history that are less widely known. They can also honour a building where a significant event took place. Plaques can also provide a sense of recognition and inclusion, appeal to people of all ages and from all backgrounds, and add character and pride to a neighbourhood. The Bristol Blue Plaques Scheme is administered by the Blue Plaques Panel of the Bristol Civic Society. It is similar to the scheme which was formerly run by Bristol City Council. Regarding applications for plaques outside the city and county boundary, in South Gloucester or North Somerset, the Panel can offer advice on bespoke plaque design and manufacture. It cannot, however, consider a BCS blue plaque for these neighbouring district authorities. Who can be commemorated on a Blue Plaque? Individuals or organisations commemorated on a plaque should be of national or international stature, or of outstanding local importance. They may have achieved national or international prominence in any field, including (but not limited to) academia, architecture, the armed services, the arts, commerce, education, engineering, industry, the law, literature, medicine, music, philanthropy, politics, religion and science. Or they may have made a major contribution to the development of Bristol, or the well-being of its citizens. The Panel will not approve plaques for fictional or legendary characters, or for people still living. We are aware that English Heritage blue plaques in London are awarded only after the recipient has been dead for twenty years. Clearly, their decision is based on the value of hindsight which is best assessed by distance from an event. We deliberated on this and we have settled on five years, to allow for an objective evaluation of the importance of the subject. We consider this to be sufficient time for a period of calm to descend, unburdened by emotions. This rule is applied without exception. There is no limit on the amount of time a person, group or organisation should have spent at an address or in a particular locality. In general, though, the connection should be as long as possible (certainly running into months and years, rather than days or weeks). How can I get a plaque put up? Any organisation or individual can suggest a person to be honoured with a plaque. 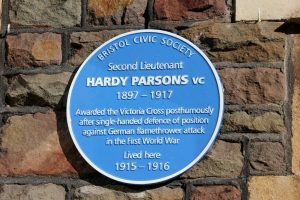 The Bristol Civic Society Blue Plaques Panel does not itself nominate people; its role is to approve plaque nominations and provide advice and support in erecting them. The Panel will require evidence that the individual being honoured had any connection with the building for which the plaque is proposed. You will also be asked to state your views as to why the person deserves a plaque. The design of Blue Plaques must be approved by the Blue Plaques Panel. They are made to a standard design, with a specific typeface, as it is important for our plaques to be readily identifiable. A plaque must not advertise any company, product, organisation, website or app. Plaques must be placed in accordance with local planning laws and other regulations, and only one plaque will normally be placed on any building. Before a plaque can be erected, the owners of the building in question have to give their written consent and any other relevant permissions need to be obtained. This may involve approaching more than one party: the owner of the freehold as well as the tenant. Once a plaque has been installed, it becomes part of the property to which it is fixed and is thus owned by the property owner. Groups or individuals proposing a plaque will need to cover the cost of its manufacture and installation. If the funds are not immediately to hand, you can consider fundraising or sponsorship. The Civic Society does not have a budget for plaques, but its Blue Plaques Panel can advise on design, manufacture and placement on facade. The Panel can also seek estimates for the work, which is currently in the region of £600 to £850, depending on plaque size. The first step in applying for a plaque is to fill out this form and send it to the Panel. Use this link for details of the Blue Plaques awarded.